But you can’t choose your neighbor and Pakistan is the biggest. It is a mixed blessing that Pakistan is defined politically by the province of Punjab and its heart beats in Lahore. Our blighted common history is most deeply etched in the minds of Punjabis. The upside is that PM Nawaz Sharief has a natural proclivity to develop his province; Punjab. In our Punjab, the BJP has an ally in the Akali Dal. Defence Minister Jaitley has laid claim to his Punjabi heritage and is likely to grow his links with Amritsar. Most importantly, our Punjab has been in relative decline since the 1990s; an outcome of poor fiscal management (Aiyer.S.2012 CATO) by both the Congress and the Akalis. Too many freebies and too little revenue wrecked Punjab, despite its robust agriculture; medium scale industry and vibrant entrepreneurship. The immediate problem is jobs for unemployed youth. Economic prosperity allows a decent standard of life for even the unemployed young due to family wealth. But drugs and alcohol addiction are the downsides for directionless young people; too rich to work in the manual and semi-skilled jobs available. Rapid industrial growth is the answer for “quality jobs”. Trade and investment normalization, between Pakistan and India, can immediately benefit the two Punjabs in volumes which could be significant for the two entities. When we expand the analysis to the national level, the welfare gains reduce and point to an imbalance in favor of India. The full potential for trade is estimated at around USD 20 billion or ten times what it is today, by ICRIR (2013), FICCI (2012), CUTS (2012) and Hafeez Pasha, a previous Finance and Commerce Minister of Pakistan, now Dean of the School of Social Sciences, Beaconhouse National University, Lahore. This would still be only 6% of India’s total trade but nearly one half of Pakistan’s total trade. It is unlikely that Pakistan would want to be in the precarious position of being dependent on India’s market to that extent. The realistic bound for trade level is consequently much lower. But this makes it of less interest nationally. Since the business opportunity comes with the considerable risks of insecurity and the adverse impact of an uneven keel in diplomatic ties, businessmen are justified in spending even less time on it. To complicate matters, the central government in India is no longer in the drivers’ seat. Business opportunities are best defined outside the ambit of government sponsorship and regulation, not within it. Shrinking fiscal space narrows the opportunities for “directed entrepreneurship” of the Chinese kind. Increasing levels of fiscal federalism and enhanced private investment has strengthened the role of state (provincial) governments in industrial development. Local labour and land regimes have become key to private investment. Pratap Singh Kairon, Chief Minister of post-partition Punjab (including Haryana and Himachal Pradesh) was famous for micro managing economic development and inviting industrial investment to, what was then, a dusty, rural, unskilled hinterland, a mere adjunct to the urban marvel of Lahore, which still shines as a jewel. But successive governments in Indian Punjab have grown it into the granary of India by utilizing its comparative advantage. 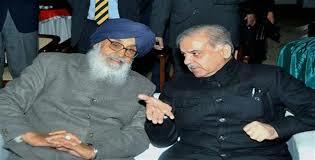 It is now time to pool the resources of the two Punjabs to mutual advantage. Naysayers and conspiracy theorists will point to the downside of closer ties between the two Punjabs providing a basis for the break-away of an amalgamated Punjab from India. Either due to the allegedly “burning” desire of Pakistani elites to undo the shame of the break-away of East Pakistan, by amalgamating our Punjab into Pakistan. Alternatively, but less likely, the theory goes, this could happen due to the efforts of the Khalistani’s to become a separate nation. Break-aways from India are a romantic’s fantasy, both in Kashmir and in Punjab. Both Kashmiri’s and Punjabis have much more to lose by breaking away from India, than there is to gain, by either carving a separate identity or amalgamating with Pakistan. “Landlocked” developing countries are more prone to fail, as separate nations, for a variety of reasons. Paul Collier (2007). Punjab and Kashmir qualify on that count. India’s Punjab, Haryana and Delhi have a combined GDP of around USD 190 billion; broadly similar to the GDP of Pakistan. 85% of Pakistan’s GDP is derived from Punjab and Sindh and 54% of the population is Punjabi. “Punjabiat” is consequently a significant force in forging closer links. But historian Zoya Hassan warns against falling into the trap of assuming that cultural history and identities on both sides of the border alone can drive the future. The political architecture; composition of the elites and aspirations have diverged considerably, since 1947. Notwithstanding the loss of close cultural similarities, economic cooperation provides a firm and sustainable basis for growth and positive welfare benefits on both sides of the border. It may be wise to be practical rather than romantic or aggressive in identifying what is possible even with the bon-homie current prevailing between the two PMs. Three generic principals can help to make identification of the entry points. First, trade and investment liberalization can never come at the expense of decreasing levels of security. Any adverse impact must be swiftly containable. This implies that normalization proposals must preclude the proliferation of generalized person-to-person contact. Second, the proposal must be tightly monitorable. This implies its implementation in a defined and sanitized environment. Third, it must provide real benefits-jobs and business to local populations along both sides of the border. All three conditions are met if India proposes a jointly administered industrial hub along the Punjab border with a target of creating 1 million jobs and a turnover of USD 40 billion. This could be an EPZ linked both to Karachi and Mumbai or a combination of an SEZ and production for meeting domestic demand. Naturally 100% FDI would be available with attendant harmonized tax structures. Since farmers on both sides complain of poor productivity, due to the insecurities of a border area, getting land should not pose difficulties. This would be made easier if displaced farmers are offered commercial incentives in real estate development. The facility could link into the proposed Amritsar to Calcutta and the Delhi to Mumbai industrial corridors on the India side. Like Pakistan, which faces growing fiscal pressure from dwindling external aid and has to meet the demands of its demographic dividend, the Akalis are under pressure in Punjab to shape up or ship out. The Defence Minister, Jaitley fell prey to this public disenchantment with the Akalis by failing to get elected from Amritsar. Time for Mr. Badal to act before he and Punjab miss the bus yet again. PreviousSpicing the Pak-India “Punjabi Tango” with Gujarati Dandia could yield results.